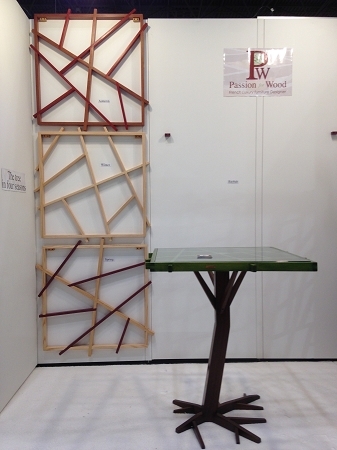 David Martin artist, designer and craftsman for Passion for Wood - 4 Seasons Table in a choice of 4 colors. 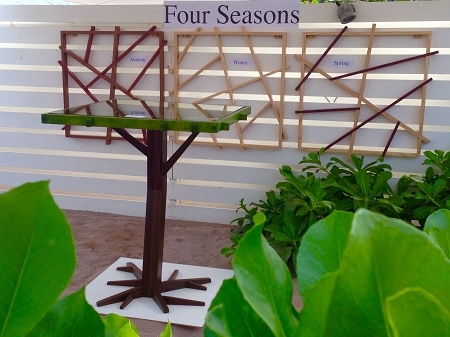 The Four Seasons Table comes in a choice of four (4) colors - Summer, Autumn, Winter and Spring. Choose your season - choose your color. 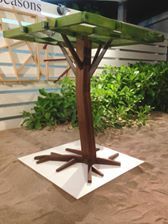 It is a high table, bar height or "eat standing" height, with a tree-shaped leg. This one's leg is bent like an elbow. 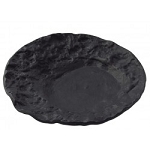 The foot base is finished with the effect of a tree's roots giving it more stability. 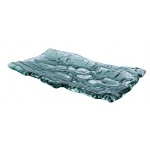 The size of this table is: 90 cm (L) x 90 cm (W) x 110 cm (H) or about 35.5 inches long x 35.5 inches wide x 43.5 inches tall. The total weight is up to about 20 kg, which is about 44 pounds. The wood used for the trunk is "Smoked Oak" to give it that perfect tree trunk color. Spring: American (U.S.) White Ash with an Amaranth red color wood stain. Since this table is being custom made to your woods/colors specifications, no returns, no exchanges, no refunds and no store credits will be allowed. 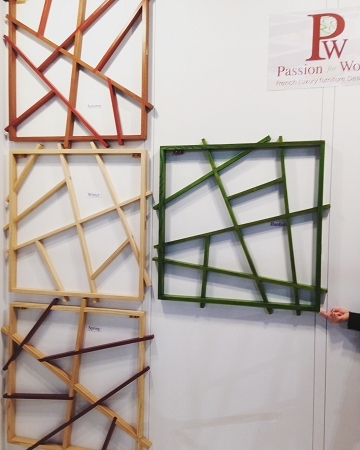 Therefore, if you want to match this table to your existing home furnishings, please choose the best matching woods/colors from the charts.